I was diagnosed with Type 1 diabetes at age 9. Over the years I had complications, which include congestive heart failure, neuropathy in my stomach and legs, seizures and high blood pressure. I was sick and in and out of the hospital for most of my life. I had to take several medications, and at age 30 I was diagnosed with end stage kidney failure. I started dialysis immediately. For six years I was on dialysis. Four of those years I was jumping through hoops to get on the transplant list. I was unable to travel, I had no energy and my kidneys stopped producing urine. I was approved to be on the kidney/pancreas transplant list. The first two phone calls I got about donors being available didn’t work out, but the third call did. On April 29, 2015, I had a successful kidney/pancreas transplant. After my transplants, my whole world changed. I have so much energy. I feel wonderful. I can now go traveling, camping, hiking and run around with my children. My health is great. My donor was a young girl who loved cheerleading. I’m so lucky to have her be a part of me. I have met her whole family. We are forever connected I am forever grateful. Become a part of Jessica Drey's story. Click Here. 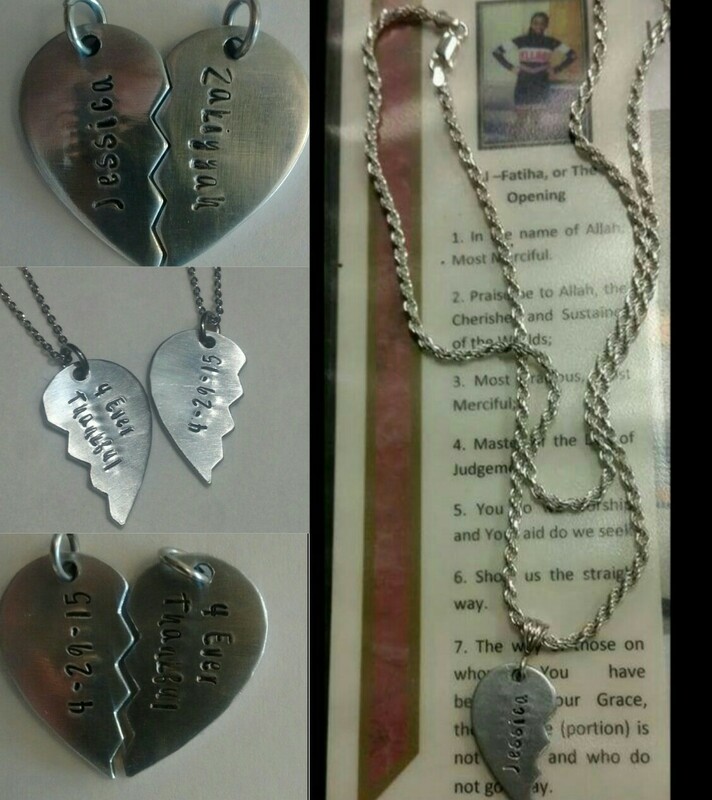 I created this necklace for me and Zakiyyah ( my donor). My half of the heart says "Zakiyyah" and my Transplant date. Zakiyyahs half says "Jessica"and forever thankful. Zakiyyahs father has her half and I wear my half. Her kidney and pancreas were donated to me but we will always be connected in our hearts. I hope to make more necklaces for Transplant Recipients and their donors. What a beautiful token of appreciation!